Scientists in a range of disciplines are increasingly turning to drone technology to facilitate discoveries and recover data that would be otherwise impossible to gather. One particularly complex and perilous field is that of wildlife study, specifically the preservation of endangered animals. In 2017 over 1,000 rhinos were poached, further driving down numbers in the already endangered population. The need for wildlife data is at an all-time high as many animals face extinction, and drones can detect minimal changes in animal numbers quickly enough to help in preventive conservation efforts -- drastically curbing the rate of endangered species decline. Here are just a few of the ways drones are contributing to the preservation of endangered wildlife. Accurate monitoring of species counts is essential to conservation efforts, and traditional methods are inefficient when it comes to detecting the minimal changes that serve as red flags for wildlife researchers. In a series of tests that compared counts collected by aerial drones to those totaled by experts on the ground, the drone-derived data was found to be up to 96 percent more accurate than ground counts. With this precise data, scientists can more effectively protect species before their numbers drop too low for successful conservation. 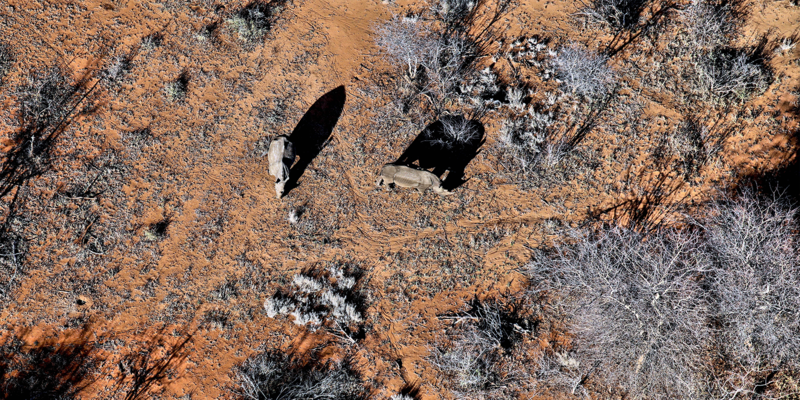 A drone’s unique ability to travel safely through areas where people and traditional aircraft can’t gives it an advantage in the various terrains occupied by endangered animals. Drones can fly above these sensitive inhabited zones without creating disturbances among wildlife, yet still be close enough to gather highly detailed aerial images more useful than those collected by researchers on the ground. Employing the use of specialized lenses in drone wildlife observation has given scientists valuable new options for fighting poachers. Poachers are most likely to attack at night, and infrared cameras easily pick up images of both animals and poachers where wildlife guards typically miss them under the veil of darkness. The heat seeking technology can also be used to detect sick or injured animals through temperature fluctuations, and aid guards in rescue operations that save endangered species. The improved accuracy of drone data has served to advance the capabilities of predictive analytics in wildlife research. According to the Air Shephard Initiative, data collected by drones in the field has assisted the organization in identifying future poaching sites using finely tuned algorithms. The results allow rangers to track down and intercept poachers before they have the opportunity to endanger wildlife. Looking ahead, the organization believes this drone-enabled technology has the potential to eradicate poaching in sites where it is deployed. With their advanced accuracy in wildlife counting, minimally invasive monitoring, custom lenses finely tuned for each environment, and ability to quickly process data, drones are becoming a valuable tool in the preservation of endangered species -- as well as in the fight against illegal poaching that presents dangers to animals and humans alike.